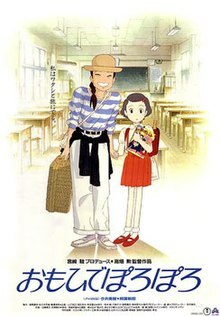 On Sunday afternoon we took the girl to see the 1991 Studio Ghibli film Only Yesterday (part of a great SG retrospective screening at Pacific Cinematheque, which ends tomorrow), and it was quite a lovely romp. It was her first non-dubbed foreign language film, and she wasn’t able (as predicted) to keep up with all the subtitle reading. So a number of (I counted about a dozen) whispered explanations about what was going on (thanks to mummy) ensued. the scene where Taeko acts in her school play, embellishing her scripted lines. I won’t list off the worst parts, but she did find it highly traumatic to witness Taeko get struck by her father; she cried at this. Marina St liked this on Facebook. Marina Stamboulieh liked this on Facebook.